Ideation International is the leading provider of innovation software based on the Theory of Inventive Problem Solving (TRIZ) and the TRIZSoft theoretical foundation. The TRIZSoft® line of innovation products is designed to help individuals achieve consistent, expeditious solutions to complex problems. Novices, enthusiasts and certified TRIZ practitioners will find TRIZSoft® applications easy-to-use and capable of accelerating the process of successful technological innovation. Comprehensive professional tool for inventive problem solving. The Innovation WorkBench® 2005 (IWB) software is a professional tool developed to help users solve the most challenging technological problems and provide solutions for red-alert emergencies. The software incorporates powerful problem-solving features packaged in a user-friendly format and is compatible with Ideation’s Brainstorming 2.3 software. IWB® features a Problem Formulator® that has been significantly improved as an analytical knowledge-transfer tool which helps identify and bring into sharp focus the interplay of cause and effect between useful and harmful functions in any system, business or engineering application. Besides access to over 400 Inventive Principles or “operators” (patterns of invention), the new IWB software gives users a number of critical advantages. Self-explanatory diagrams for easy navigation of the software. 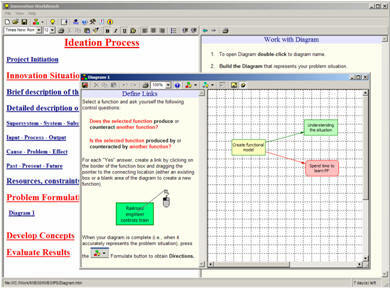 The ability to manipulate the appearance of Problem Formulator diagrams through expanded graphic options and name links to show cause-effect relationships between system or process functions. Comprehensive reports can be generated in word format to facilitate collaboration between IWB and non-IWB users. Track your projects instantly despite long interruptions to the process and quickly identify where to resume working. Simplified tool for solving problems of light to medium complexity in individual or team work format. Ideation Brainstorming 2.3 has been developed to help users perform lightweight problem solving. The product is also equipped with an introduction to I-TRIZ to give users a taste of the methodology’s basic principles for inventive problem solving while providing the knowledge and skills to brainstorm ideas. The software is structured in an easy-to-use four-step process. Define Your Problem – Defining the system you want to improve or create is a critical first step. Your answers will determine the systemic level you use to consider the problem. By describing your system’s primary function, the supersystems it belongs to, detailing inputs and outputs of the system, causes and critical conditions of the problem and potential consequences if the situation does not improve; you will create a true understanding of the problem, identify your barriers to success and form an Ideal Vision of the solution. Once you have accomplished this step you are ready to move on to the next stage. Formulate Tasks and Brainstorm – Typically when problem-solving, contradictions will surface. 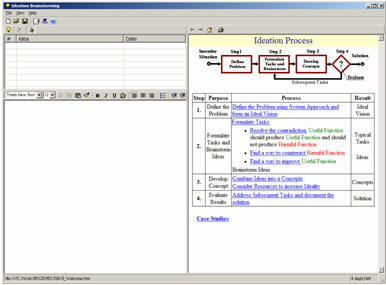 The software’s 120 Inventive Principles or “operators” (patterns of invention) represent best inventive practices that allow you to generate a list of ideas on how to resolve contradictions or in simpler terms – find a way to counteract any harmful functions that may result while improving useful functions – and move to realization of the solution’s Ideal Vision. Develop Concepts – In step three, you’ll harness the ideas you generated from Step two and combine them into concepts. This segment also helps you consider resources you may have to increase ideality. Evaluate Results – In the final segment, you’ll address subsequent tasks and document your solution. Professional tool for inventive problem solving in non-technical areas (business, management, marketing, logistics, etc.). A business tool for systematic problem solving, ideal for anyone — from students to managers — involved in resolving everyday or complex business dilemmas. This software helps users capture detailed information about a problem situation and translate that data into a visual model that links cause-and-effect relationships to specific events and conditions. Using the patented Problem Formulator™, the Knowledge Wizard then generates a comprehensive set of “directions” for innovative thinking, helping users develop a broader cross-section of ideas and puts them in a position to make confident, well-informed decisions. This dynamic approach leverages individual and team knowledge, and helps pinpoint the most promising opportunities. Professional tool for revealing root causes of undesired effects (accidents, failures, production defects, etc.) and their elimination (prevention). This powerful software tool utilizes the I-TRIZ application Anticipatory Failure Determination (AFD) to analyze failures whose causes are unknown, then helps the user find ways to prevent or eliminate the revealed failure mechanisms in the system. Also included is Basic I-TRIZ e-Learning, which teaches you the foundations of the I-TRIZ methodology (on which Anticipatory Failure Determination is based) in 4 hours or less. Professional tool for predicting possible undesired effects and events (accidents, failures, production defects, etc.) and their prevention. A valuable tool for design, quality, reliability, manufacturing, R&D, and safety professionals. This system employs the I-TRIZ application Anticipatory Failure Determination (AFD) to predict and prevent potential failures in systems, products, processes and technologies. This aggressive approach helps users determine potential harmful effects and weak points in a system, product or process, then prevent them from manifesting. Intellectual Property Management – a professional tool for evaluating and enhancing patents, disclosures, and applications, “inventing around” patents, and protecting patents from inventive competitors. Ideation Brainstorming for Solving Non-Technical Problems – a tool for solving problems in business, management, marketing, logistics, etc. in an individual or team setting. Directed Evolutionted – provides a streamlined, accelerated and controlled evolution of various evolving systems including any kind of products, processes, services, technologies, etc. Businesses and/or organizations, countries and human society as a whole can benefit. Research WorkBench – is a software application for solving scientific problems in engineering, biology, sociology, math, etc. In development since the early 1980s, the RWB is based on the I-TRIZ Subversive Analysis method (also known as Anticipatory Failure Determination or AFD).